When I first arrived in Ojai and stepped out of the car, an instant calming feeling came over me which is what I’d been craving for months. But before we even checked into the hotel, my friends and I had one thing on our minds…LUNCH. 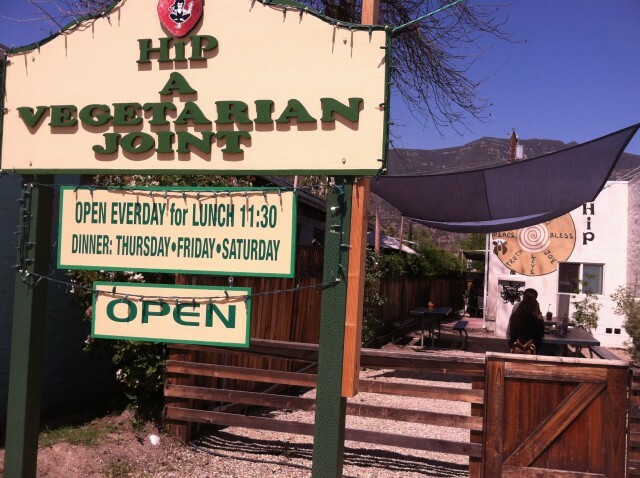 Our first (but certainly not last) stop was Hip, a vegetarian restaurant close to our hotel. My friend Angela had been there before numerous times and raved about it. I quickly learned she had every right to. Not only was the owner one of the nicest, most genuine men I’ve ever met, but the food fills the body and the soul with exactly what it needs. All four of us ordered something different, but my 2 favorites were the Indonesian Wrap and the Hip Hip Hooraw Wrap. 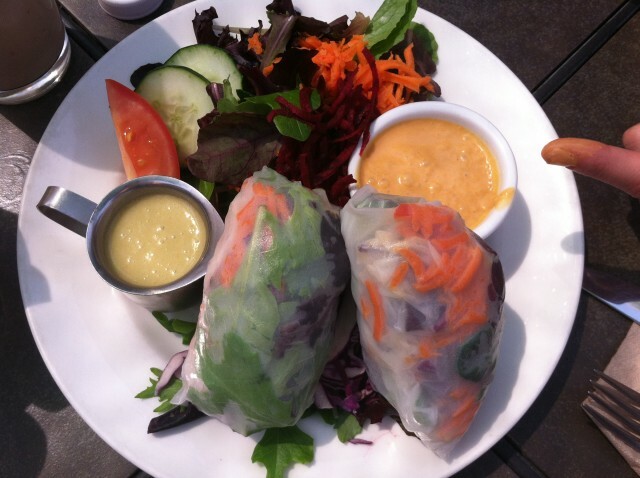 The Indonesian Wrap had tempeh, cabbage, carrots, red bell pepper & mint rolled in rice wrappers. It was served with a peanut-coconut dipping sauce that I could easily drink with a straw on any given day. It also came with a side salad and shockingly to me, the dish really does fill you up. 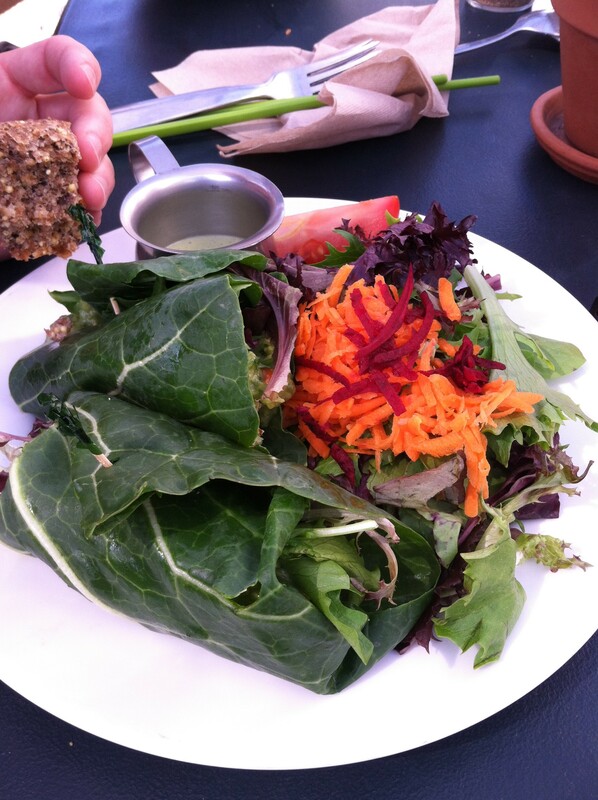 I recommend the tahini poppyseed dressing for the salad. Scrumptious! The Hip Hip Hooraw Wrap had spicy jalapeno almond paté (never had it before and fell in love), gauc & lettuce wrapped in collard leaves. I was skeptical at first until I took my first bite and then I was hooked. I couldn’t get enough of the spicy almond paté. Even meat-lovers would like this wrap. Dining at Hip was the perfect way to start our mini-vacay. We couldn’t help but go back the next day for lunch because we just couldn’t get enough. 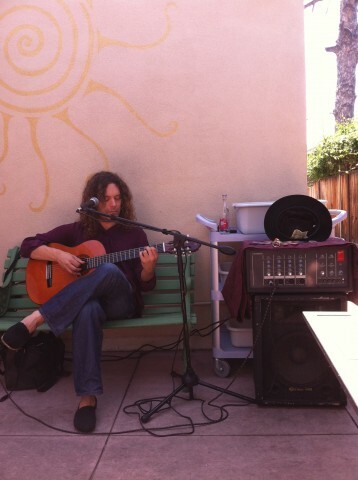 And if delicious food wasn’t enough to make me fall for this place, there was a guitarist playing beautiful Spanish music which just added to the unconditional love you can’t help but feel in Ojai. The “Barbara Style” Salad is my friend’s favorite dish. It’s mixed lettuce, marinated greens, beets, carrots, avocado & quinoa. It’s served with a tasty seed bar. We also tried the Hummus Wrap which was filling and full of flavor.